Allow for the extraordinary to emerge. 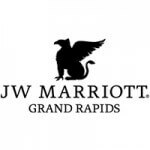 The JW Marriott Grand Rapids is considered a world-class hotel for both business and pleasure. Located in downtown Grand Rapids, Michigan, just 25 miles from Michigan's celebrated West Coast, the JW has 337 well-appointed, smoke-free rooms and suites on 23 floors. Among the uncommon amenities, each private retreat has wireless Internet access, a 42" flat screen TV and luxurious bedding. Attentive guest services include on-call housekeeping and a 24-hour fitness facility. Guests residing on the concierge floors will also enjoy extended round-the-clock services and secured privacy, as well as access to the stylish concierge lounge. In addition, the executive business center offers 24-hour faxing, copying, printing, and shipping services. Inspired dining at the JW's signature restaurant, six.one.six and our stylish cosmopolitan lounge, mixology, rounds out our plush conveniences.